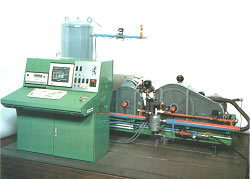 The stages of compression are distributed on two separate machines. By variation of their speed it is possible to change the stage pressure relations within wide limits. Controlled inter- and after-water-cooling and cylinder air-cooling provides adjustment of all variations of performance. Indicating determines the internal work automatically. 1. Stage 2-cylinder compressor driven by frequency controlled electric engine with speed- and torque-measurement. 2. Stage 1-cylinder compressor driven by frequency controlled electric engine with speed- and torque-measurement. Equipped for indication. The two compressors can be operated in single-, series- and parallel circuit. Inter- and after-cooling with water is temperature controlled. The vessel-pressure is controlled automatically. PID-based control of inter- and after-cooling. The controller's parameter can be set by the software. The stages of compression are distributed on two separate machines. By variation of their speed it is possible to change the stage pressure relations within wide limits. Together with the controlled inter- and aftercooling all variations of performance can be adjusted. Indicating determines the internal work automatically. 1. 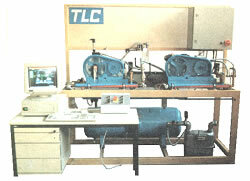 Stage 2-cylinder compressor driven by two-speed motor with electric power measurement. 2. Stage 1-cylinder compressor driven by frequency controlled electric engine with speed- and torque-measurement. Equipped with indication device. PID-based control of inter- and after-cooling. The controller's parameter can be set by software.